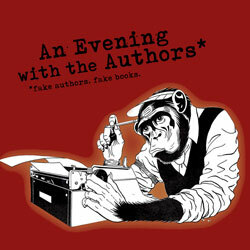 * Fake Authors. Fake Books. Real Funny. The show is strange, sometimes dark, often ridiculous and always hilarious. A technical error has replaced our usual show with "The Church of Positivity with Tambourine Terry". Dana Glass presents live readings from a questionable marine biologist, an angry blogger, a retired librarian with an affinity for dinosaurs and the maestro of murder. Featuring: Isaac Landfert, Dawn Olsen, Angela Smith and Stephen Vincent Giles. Dana Glass is joined by his new co-host, morning zoo veteran, Wolf "the Crab" Turkensten to present readings from an eclectic group of writers. Fictitious public radio host Dana Glass interviews the American truck driver/author "Porkchop". Featuring: Isaac Landfert and Stephen Vincent Giles. Fictitious public radio host Dana Glass interviews the astronaut Bob Tulip, author of "The Great Space Race Disgrace"
Featuring: Isaac Landfert and Joe Bates. Fictitious public radio host Dana Glass interviews the creator of E.S.B.D.M. (Electronic Story Based Dance Music)- Dj Candy King. Featuring: Isaac Landfert, Austin Reel, Pauline Shypula and Stephen Vincent Giles.